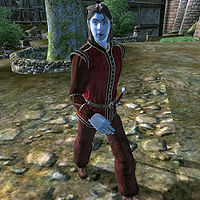 Varon Vamori is a Dunmer bard living in Bravil. He's a member of the Thieves Guild who offers advanced training in Speechcraft. His frustration over the lack of communication with his beloved Ardaline results in him stealing her Mages Staff and selling it to his friends. During the related Recommendation quest, you'll have to sort things out. Varon has a secret crush on the shy Ardaline at the Mages Guild, but even though he's quite good with words, he just can't get through to her. He doesn't give up, though, and everyday at 8am he spends two hours in the guild hall, trying to tell her how he feels about her. After being rejected once again, he goes to the Silverhome on the Water, where he spends most of his day, wandering around and talking to the other regulars. He leaves the taproom at 4pm and heads to the Great Chapel of Mara where he receives several blessings from the altar of Dibella. After that, he returns to the Silverhome and stays there until he heads back home at 9pm. After three hours of wandering in his house he goes to bed at midnight. He wakes up at 6am and spends the next two hours in the house, before it is time to give Ardaline yet another go. He offers training from 6am to 8am and from 9pm to midnight, daily. He wields a fine steel shortsword and wears a burgundy linen shirt, a pair of matching linens and thick cowhide shoes. He also carries around his house key and a considerable amount of gold. Varon has the ability to use a leveled set of bard spells. The very first time you meet him he will greet you by saying: "Yes. I am Varon Vamori, Wit and Wordsmith. Bravil's foremost Bard and Advanced Trainer in Speechcraft." If you ask him about Bravil, he will recite one of his own poems: "Old, worn, and wicked. Wet, wounded, and wild. Empty as the eastern horizon, dusk on the Niben. Solemn and bitter as the grave." Being an advanced trainer, Varon can provide you with the necessary reference for the Speechcraft Training quest. Once your Speechcraft skill level reaches 70, speak to him and choose the "training" option, which will trigger the quest and this dialogue: "Have you ever heard one of Tandilwe's sermons at the Temple of the One? Goodness, that woman knows how to orate. You should consult her. I'm sure she can give you more training." The citizens of Bravil will often talk about him: "Varon Vamori really has a silver tongue. ", "Have you ever spoken to Varon Vamori? and "Have you seen Varon Vamori recently? Even though they will admit he can be a bit strange: "Varon Vamori can be really charming. Of course, there's something a bit odd about him as well." Others will reply: "He has a way with words, that's for sure." and "You could learn a lot from him. and I don't know him too well, but I have heard he's a smooth talker." Resident Light Armor trainer Luciana Galena will also recommend Varon: "Other Bravil trainers? City-Swimmer teaches Sneak. Dro'shanji teaches Security. Varon Vamori teaches Speechcraft." Varon's fascination with Ardaline is hardly a secret in Bravil. The townsfolk can be heard saying: "Seems to me that Ardaline has an admirer in Varon Vamori. ", "Something strange is going on with Ardaline and Varon Vamori. I always see him hanging around her." and "Varon Vamori seems very glum lately. I guess things aren't going well with Ardaline." while others will just respond: "I've noticed the same thing. I wonder what's going on there." and "It seems a bit odd. I don't know how Ardaline feels about it." Indeed, during the Bravil Recommendation quest, the ever-responsible guild head Kud-Ei will ask you to sort out Varon's stalking habits: "I'm very preoccupied with this situation concerning Ardaline. Perhaps you can help with that, however. I can't directly get involved, for fear of embarrassing the poor girl. I'll need you to have a little chat with Varon Vamori, and you can learn something about the power of Illusion in the process." She will the proceed to describe how Varon is getting out of hand: "I don't understand it. Some ridiculous male thing, I suppose. He's been bothering Ardaline every day for a while now. He even stole her Mages' Staff! Perhaps he thinks it's amusing; I don't know. But it needs to stop. It's making her miserable." and will then task you: "You're going to get Ardaline's staff back. Take this charm scroll. With it, you should find Varon more receptive to questioning. Don't come back without that staff." When approached, Varon will ask: "Can I help you?" When asked about Ardaline, he will act innocent: "Yes, I sort of know her. Well, I mean I don't really know her, but I've talked to her some." After raising his disposition, his greeting will become much more friendly: "Hello, friend! What can I do for you?" When asked about Ardaline at this point, he will spill the whole story: "I don't know what to say. All I want is for her to care about me, to feel the same way as I do about her. But she doesn't. I try and I try, and it just doesn't matter. It makes me furious sometimes!" Asking him about Ardaline again will make him say: "I've never laid a hand on her. Either in anger or... I've never hurt her, okay?" If you used one of Kud’Ei’s scrolls and the effect wears off, asking him about Ardaline will have him reply differently: "I don't feel comfortable talking about her with you anymore." He will also admit stealing her Mage’s Staff: "All right, I admit it. I took it from her. I... I don't know what I was thinking, honestly. I was trying to tell her how I feel.... again... and she wouldn't even stop to talk to me. I just got so angry! I was a little ashamed afterwards, but didn't know how to apologize or give it back. I wish I could... I'm afraid I don't have it anymore, you see. I... I sold it. To a friend of mine, Soris Arenim." Asking him about the Mage’s Staff again will net you: "If I still had it, I'd gladly give it back. You'll have to talk to Soris Arenim if you want it." He will then elaborate on his friend Soris Arenim: "He lives in the Talos Plaza district of the Imperial City. He's the one who has Ardaline's staff now." He will finish conversation with a request: "Tell Ardaline I'm sorry." Varon Vamori doesn't own his own bedroom door, so may sometimes be found locked inside his bedroom, trying to get out.